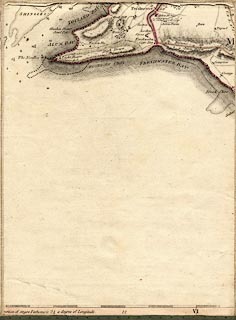 Map, hand coloured engraving folded in a slip case, Hampshire, and Isle of Wight, scale about 1 mile to 1 inch, surveyed by Thomas Milne, published by William Faden, Charing Cross, London, 1791. The map has insert town plans; Southampton, and Winchester, at scales about 1 to 7500, about 8 inches to 1 mile, and a view of the West Gate, Winchester; the town plans have lists of sites of interest; there is a list if the bailiwicks in the New Forest. The map covers 0d41m to 1d56m W, 50d34m to 51d24m N; Winchester is at 1d12m W which suggests a prime meridian 6+ minutes W of Greenwich. The map is sectioned and mounted on linen, folded in a slip case. For study purposes, not on the original, sectionned pieces of the map are numbered 1..8 across, 1..6 upwards, from the bottom left, which is part 11.